Visualizing graphs requires strong automatic layouts capable of untangling your data and revealing the insight buried within. A good layout is essential for untangling and understanding any network. Currently, KeyLines offers eight layouts that have been designed to ensure consistent, reliable, clear structures, suiting any kind of network. ‘Standard’ is an efficient, force-directed layout. 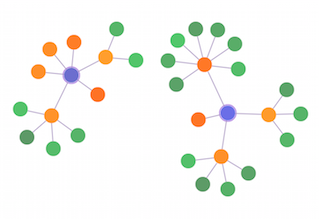 This means that it constructs the graph so links are a consistent length, nodes and edges overlap as little as possible and are distributed evenly in the chart. Its consistency and simplicity helps makes it a good catch-all for any kind of data and any size of dataset, particularly useful for finding patterns and symmetries. This is a force-directed layout designed specifically for your biggest data-sets. It detangles complex networks by spreading nodes and links apart, so multiple components are laid out in a circular arrangement with larger components in the centre. The pattern is easy to understand and helps reveal underlying structures. Most people are familiar with this kind of layout – essentially a family tree of nodes. Child nodes are shown in horizontal layers below their parents, with the connections working top-down through the chart from the original subject. This layout works particularly well for workflow or process visualization, impact analysis or, unsurprisingly, for showing hierarchical relationships. The KeyLines sequential layout is a good way to display data that contains a clear sequence of links between distinct levels of nodes. It takes multiple components into account, minimizes link crossings and makes really efficient use of the available screen space. The sequential layout is helpful for understanding data where there’s a clear parent-child relationship between nodes, but where the nodes also have a set tier or level that needs to be communicated. This functions in a similar manner to the standard layout, but nodes with similar attributes are grouped together in fans. This is particularly useful to get an overview of the clusters within network, but do not want to focus into one particular cluster just yet. Our Radial Layout arranges nodes in concentric circles around the original subject in a radial tree. Each ‘generation’ of node becomes a new orbit extending outwards from the original parent as the dependency chain grows. Generally, this layout is the best option when dealing with networks with a large volume of child nodes to each parent. The lens layout gives fresh insight into the connections between nodes. Specifically, this layout has been designed to push highly-connected nodes into the center, and force the less connected nodes into the periphery. This results in an attractive ‘lens’ view and is particularly useful for large networks. ‘Tweak’ is a force directed layout designed to show how networks evolve. The layout adapts itself as links are created and destroyed, allowing the viewer to see clearly where and how the changes happen. It is ideal for visualizing the behavior of dynamic and changing graphs.